Hello everyone, and welcome to this week’s Prayers for the Week post. 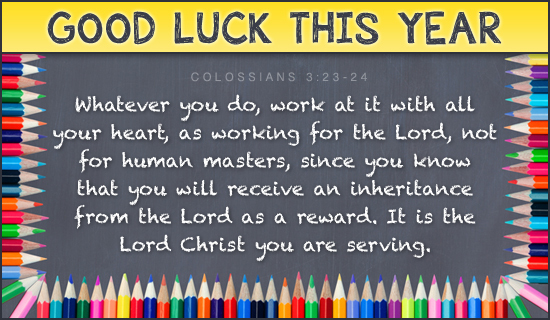 For many of you, your children are getting ready — or already have — gone back to school, and while we don’t go back to school for another week, it seems appropriate that we mention the changes that come to so many of us, and to offer up our prayers for a successful school year. This week we have incorporated a new email address for you — if you want to email us your prayer requests, please feel free to do so by emailing prayer@mydreamsofdisney.com. To all the students starting school, be appreciative of the freedom you have to learn. Some children are not as fortunate. Be proud of who you are and believe in yourself. Be kind to those you meet. Some of your peers may be struggling to make friends or struggling with their own insecurities. If you see someone being bullied or picked on because he/she may seem a little different, step in and do what you know is right. Say “hi” or smile at them in the hallway. You never know what that person might be facing outside of school or battling inside. Your small act of kindness may make a BIG difference in someone’s life this school year! To all the teachers, both new and “seasoned,” know that you have been called to the teaching profession for a reason. The minds and hearts of the students you teach will forever be changed. You have been given the chance to be an influence and an inspiration to your students. As hard as it is to deal with the politics of school systems and new policies, just remember why you are there—to educate and provide a safe environment for the young people you have been given. What you offer them today may have a lifelong impact on who they become. To all the parents sending your little ones off to school for the first time, stay strong. I know it’s hard. You can cry as soon as you get back to your car or walk back inside. Your kids will be fine. The excellent women and men who will be teaching them this year will pour into their little minds and hearts. For those of you with children starting middle school or high school, stay positive and encourage your child. Build them up and be available when they need you. This is a big step and there will be trials. However, your children will succeed with the support of you, their friends, and their teachers. To the parents of seniors, this year is critical for your child. The journey to college is exciting and challenging. Enjoy the time you have with your senior and get involved in their lives if you are not already. As much as they may seem like they don’t need or want you, they do. Check in on them and ask about their studies and their lives. Be present. Good luck this year, and know that each of you have my thoughts, prayers, and support. Have a great school year, everyone! Thank you, Bob, for sharing such wonderful words of wisdom to all of us that are involved in the school process. Prayers for my friend Hiro Mi and her baby! Here is what she wrote on Twitter:For my baby due December 13. That is so nice u are doing prayer requests on social media. Will pray for u, Cindy & Sophie 2Thanks, Hiromi! I’ll lift you up for a safe and smooth pregnancy, delivery, and I look forward to giving God praise for your baby! Katy had a quiet day… No big changes… Still peeing… Working towards weaning the vent and getting her extubated. Patrick came to visit today and did really well seeing her so sick. Mike and I are blessed with two amazing children. Patrick was so caring and asked appropriate questions. He wanted to know how everything worked. Scott and I had to say our final goodbyes to our sweet cat Forest on Friday. He was with me for 18 years (longer than most but not even close to long enough). I know many of you knew him so I decided to share the info here on Facebook or at least you know our completely ridiculous attachment (I know!) to our animals so this was the hardest thing I have ever had to do. I am SO appreciative of all of you guys kind words and prayers to both of us. It was a horrible experience but just knowing he is now in peace makes it easier (well maybe one day it will :)). RIP my sweet Forest…you were the BEST kitty cat ever.Please pray for their comfort moving on — our pets are part of our family too! When it comes to Praises, sometimes the best praises are the ones that we associate with our Grandma. Here is a praise that my great friend Torri posted:My grandmother doesn’t have much (really nothing at all). Today she received $10 in the mail from one of her friends. She hands me the money and with tears in her eyes, asks me to give it to a family in our church who is going through an excruciating time. She says, “I know it’s not much and I wish I had more, but it’s all I have”.This is how she has lived her entire life. I wanna be just like her.God Bless Torri’s Grandmother, and all of the Grandmothers out there. They are treasures that we should never forget. May I ask for a prayer? A family in the community I teach in has suffered a terrible tragedy. Parents Ryan and Elena were murdered in their home early yesterday morning. Their 16 year old son was arrested and charged, and all of this occurred while the remaining family members were apparently asleep. I knew this family, only in passing, but their daughter went on one of the theatre trips I organized and chaperoned to Walt Disney World. She was a sophomore then I believe and would have graduated this past June. Her parents were such sweet people. I simply cannot imagine what she and her remaining brother and sister are dealing with right now. Please pray for their strength and resolve as they do their best to cope with the situation. My heart just breaks.Please pray with me:Heavenly Father, the senseless brutality that this poor family has experienced – possibly from their own son — is beyond our ability to comprehend. Lord, at this point we pray for the children. We don’t know what will become of them, we don’t know if their parents were saved and are with you in Heaven, and we don’t know what will become of the one that committed the acts of violence, but here’s what we do know. We know that You are in control, and that, as horrific as this situation is, You are there to comfort the children. You are there to give them Your Peace. You are there to give them Your Strength. Lastly, and perhaps most importantly, You are there to give them Your Love. Please help them, Lord. Please keep them safe from further harm, and Lord, bring into their lives the ones that will be there to help them in the days, weeks, months, and even years ahead. We ask all of these things in the healing name of Your Son Jesus, who lived and died for us on the cross. It is in His name we pray. Amen. Let’s start with the positives… Katy has been able to successful wean down on her vent settings… has tolerated significant weans in her sedation meds. These are all things that need to be done to move towards extubation… our hope was to extubate Katy and give her LVAD a chance to work at its full capacity and that alone would be enough to help her kidneys recover.Unfortunately Katy’s kidneys are failing fast…and the fear is that we no longer have the time to wait and see if the extubation plan will work. Mike and I are having to make decisions that no parent should ever have to make. Katy is in a very tough spot and there is very little left that can be done for her. She really needs to turn the corner and turn it fast. We have to make sure that we give her the best chance possible to do that while still being very aware of her quality of life and making sure we are not prolonging the inevitable. Katy’s love of life,happiness and comfort is front and center as we make these horrible life and death decisions… all the while trying not to lose hope. With all that said… tomorrow Katy wlll be headed to the cath lab to have an ASD made… basically putting a hole in her right heart to open communication between the right and left ventricles. The hope being that it will lower the pressures in her right ventricle. All sounds good in theory but it has never been done…not here not anywhere! It is basically a last ditch effort… that sounds like it will work in theory. It is a very precise procedure because they can’t make the hole too big or her 02 sats would be much too low due to too much oxygenated blood going through… and if it is too small the hole will close on its own. While they are in the cath lab they will place the dialysis catheter so that if need be they can get fluid off that way and filter toxins as needed. We hope that these maneuvers will give Katy’s kidneys the boost they need to recover and make it to extubation. There are just no other options to try. Everyone please keep praying for our little Rockstar. . .Please pray for her fervently! My fear is that this may come to a big climax really soon, so please keep praying for her. Please pray with me:Heavenly Father, we have seen so much death and loss this week. Please care for Katy, and if it is Your Will, please keep her from suffering the same fate as some others have. Lord, please show Your Miraculous Power by healing Katy, and lifting her up as an example of what loving Jesus can mean in your life. However, it is Your Will, not ours, that matters here. Lord, hear our prayer. It is in the name of Your Son Jesus that we pray with Thanksgiving. Amen. I hate that any parent has to deal with this. My heart is heavy. I pray for the doctors, nurses, Katy, her friends and family. Today we give Praise to God for the successful birth of Kennedy, the daughter of my niece Leslie and her husband Matt. Please pray for them, that there would be nothing keeping them from leaving the hospital in time, and that they would get the patience they need from God to see them through the good times and the bad times that raising a child will bring. Thank you everyone! Please pray for my friend Jodi and her friend and family. She learned some really bad news that has her in tears. Please pray for God’s Peace, Comfort, Strength, Mercy, and Love to descend upon Jodi and her friend and their family in their time of grief. As many of you saw, this past Monday was our 14th Wedding anniversary. I wrote a special post for her, but I also want to give God all the Glory for putting Cindy and I together and enabling us to have Sophie and love her, raising her in a loving Christian home. Please give thanks to God for your loved ones, and tell them you love them every day. Lastly, this past Monday the world lost one of the people that brought so much laughter to so many, and so much kindness and love to so many other people less fortunate than him. At this time, we continue our prayers for the salvation of Robin Williams, and continue our prayers for all of his family and friends that lost him, especially his wife and children. We also pray for all of those that suffer from the same problems that Robin did, and pray that they would seek out the help that they need. If you need to talk to someone, if you are considering doing what Robin did, please call someone. The phone number for the National Suicide Prevention Lifeline is 800-273-8255. The call is free, and it may save your life. Also, if you would rather, feel free to email our prayer request email address at prayer@mydreamsofdisney.com.